We are excited that you’re considering the University of Washington for your residency. This is a dynamic department that offers comprehensive training in the clinical practice of surgery, as well as all of the components of professional development that will help you be successful in the years ahead. For many of you that involves research. The Department of Surgery’s research mission is to be the premier home for surgical research and we are proud to be consistently ranked as one of the top programs in the nation for NIH and extramurally funded research. We strive to do research that is innovative, collaborative, and impactful and we look forward to you being a part of that. As the Associate Chair for Research in the Department of Surgery, I am pleased that we have so many research training and practice opportunities for you to participate in. 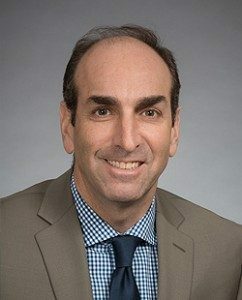 The Department has two NIH–sponsored T32 research training programs; one in basic science (led by Grant O’Keefe, MD) and one in clinical and health services led by faculty at the Surgical Outcomes Research Center (SORCE). Beyond these training programs, the Department includes a group of investigators eager to work with you in their labs and many other faculty around the School of Medicine who enjoy collaborating with surgical research fellows. No matter what path you choose for research, we are committed to helping you develop as a researcher and supporting you in your career development as surgeon–scientists. Research in the Department of Surgery is organized into 10 cores: Injury, Burn, and Inflammation; Cancer; Reperfusion; Transplant; Device and Pharmaceutical Clinical Trials; Vascular Biology; Gastrointestinal Physiology and Metabolism; Simulation and Education; Global Health; and Health Services. Each of these cores includes faculty with substantial experience who are eager to work with you in short–term research projects and longer research fellowships. This publication highlights the work of residents currently undertaking two–year research fellowships. 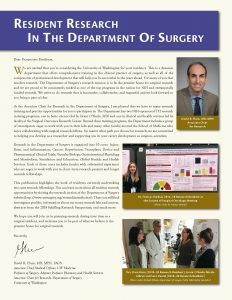 You can learn more about all resident research opportunities by visiting the research section of the Department of Surgery website. There you will find investigator profiles, information about our many research labs and centers, abstracts from the 2018 Schilling Research Symposium, and much more. We hope you will join us in pursuing research during your time as a surgical resident, and welcome you to be part of what we believe is the premier home for surgical research.